My boyfriend and I have recently begun taking walks through Prospect Park to the Central Branch of the Brooklyn Public Library. I'm not much of a library gal, mostly because my love affair with books is rooted in a materialistic and possessive need to own and display everything I've read, without the burden of overdue fees. Add that to the fact that most libraries are closed on Sunday (the best book day of all), and I've checked out fewer books since grade school than I've had birthdays. Of course, that's all beginning to change now that spring has (more-or-less) sprung and our weekend excursions to the library have proven to be healthy, relaxing, and - best of all - completely free. Last month, I decided to revisit my childhood by re-reading the chilling children's book, Wait Till Helen Comes by Mary Downing Hahn. While browsing the Juv-Fic-H shelf, I stumbled on the Shadow Children series by Margaret Peterson Haddix, a series I'd heard about on the YA grapevine but had never read. Three library trips and seven books later, I can now say that I'm hooked on the library experience and guilt-free YA pleasure reading. My 2009 booklist is doomed. The seven books of the Shadow Children series (Among the Hidden | Among the Imposters | Among the Betrayed | Among the Barons | Among the Brave | Among the Enemy | Among the Free) are set in a not-so-distant totalitarian future where devastating famines and fears of overpopulation have led to the brutal enforcement of the Population Law, restricting families to no more than two children. Any unfortunate third children born under this new regime are hunted down and murdered by the Population Police, the families who concealed them tried as traitors to the country. The protagonist of the first, second, fourth, and seventh books is Luke Garner, an illegal third-child who has lived twelve years of his life in hiding, known only to his parents and two older brothers. 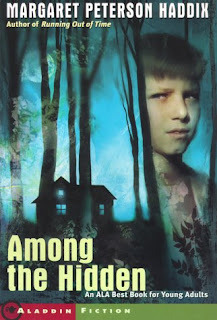 When a new development of houses built by the wealthy Barons supplants the forest behind Luke's farm, he discovers that there are other "shadow children" like him, including his new neighbor Jen who dreams of leading a revolution against the government to demand that third children be given the same rights as other citizens. While Jen's revolution ultimately fails, it sets Luke and other third children, Nina, Trey, and Matthias, on the path to freedom as they assume false identities, successfully infiltrating first a school, then a Baron family, and finally the Population Police itself, as they work with an underground movement of rebels who seek to overthrow the oppressive regime. 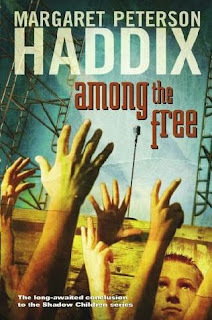 The futuristic world Haddix has created is undeniably a fascinating one, with horrors and bitter truths that are all-to-real to a 21st century already suffering the effects of overpopulation and extreme inequality between the rich and the poor. While the over-arching themes and plotting work well in each book, there are some weak characterizations with too many of the young protagonists stumbling through the series, getting lucky along the way, but rarely taking matters into their own hands. Much of the action requires a serious commitment to the suspension of disbelief as there are implausible set-ups and revelations that older readers will see coming from a mile away, but they detract only moderately from the dramatic tensions that run high throughout the series. Although time is spent focusing on other characters in the later books, the series ultimately comes back to Luke who has matured from a frightened boy to a young man still learning to trust his instincts and use his wit to survive betrayals, torture, and government coups as he struggles to stand up for the rights of all people to live among the free.